In autumn 2012 we participated in the design competition “UA Web Challenge”, which took place in Kiev and reached the final stage in web design category. 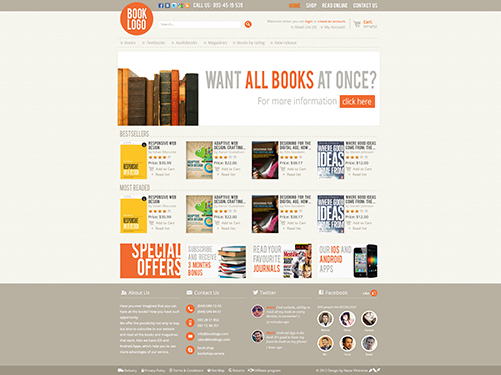 Our task was to create mobile adaptive design of bookstore website. For jury decision we provided full adaptive homepage, product page, single item page and shopping cart. In addition we designed mobile version of website. And we had integrated it with social services like: Twitter, Facebook, G+, Twitter.